A new study led by the National Oceanography Centre (NOC) and the University of Southampton has revealed a series of depressions forming mysterious “tracks” on the seafloor, which may be an unprecedented record of deep-diving whales. 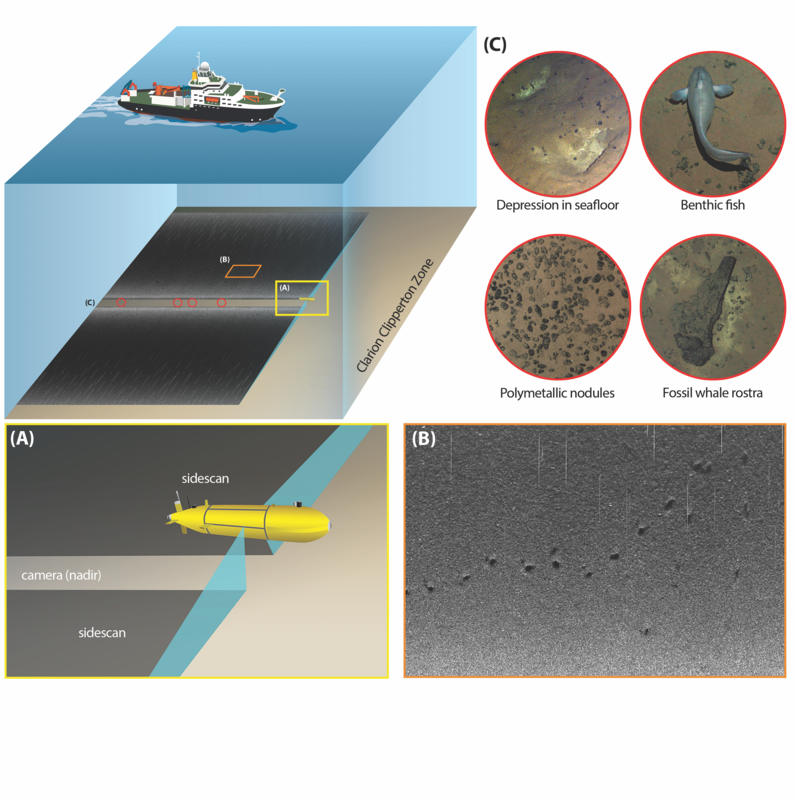 The observations were made by a type of marine robot called an autonomous underwater vehicle (AUV) in a region of the Pacific Ocean targeted for deep-sea nodule mining. At first, these tracks perplexed the researchers. They were not related to mining or scientific operations within the area; they appeared too large to be created by fish or any other typical deep-sea animals; and they were not thought to be formed by geological processes, such as gas or fluid seepage; However, these tracks did resemble those observed in other regions of the world’s oceans attributed to whales, leading the researchers to suggest that a deep-diving whale is the likely perpetrator. In 2015, the RRS James Cook visited the Clarion Clipperton Zone (CCZ), with a mission to characterise the habitats and species within the CCZ. The expedition used the Autosub6000 AUV along with a suite of other data collection methods to form an environmental baseline for this area. When processing the side-scan sonar data, the research team noticed a series of depressions on the seafloor that could not always be detected or resolved in any of the other AUV data, including the photography. In total over 3539 individual depressions were detected (in an area roughly the size of central London), to a maximum water depth of 4258 m (just over 2.5 miles). Although the researchers have not directly observed the “tracks” being made, these markings are comparable to those detected in other areas of the world’s oceans attributed to deep-diving whales. If the tracks are indeed made by a whale, they would extend the known maximum dive depth of a marine mammal by over 1000 m.
Deep-diving whales – such as beaked whales or sperm whales – are the most specialised and least understood of all marine mammals. They are inconspicuous and elusive deep divers, surfacing only briefly to breathe. Much of what is known about these whales has been gleaned from stranded specimens or material from museum collections, and as such, there is very little knowledge regarding their behaviour, habitat preferences or diets. Beaked whales have been reported to make similar markings on deep-sea mud volcanoes and, historically, there are reports of sperm whales ploughing the deep seafloor and getting entangled in telecommunication cables. In shallower waters, on the continental shelf, other species of whale are known to utilise the seafloor for feeding or removing dead skin, however, in the deep ocean, it is still unclear why whales would make such marks. This research was published in Royal Society Open Science and was funded by the European Union Seventh Framework Programme (FP7/2007-2013) under the MIDAS (Managing Impacts of Deep-seA reSource exploitation) project, grant agreement 603418. Funding was also provided from the UK Natural Environment Research Council (NERC) through National Capability funding to NOC.